BSNL Postpaid plans has launched new Monthly rental plan of Rs.299 across Gujarat Telecom Circle. State runs Telecom Company Bharat Sanchar Nigam Limited (BSNL) has introduced ‘Plan 299’ (Exclusive of Services tax) under Fixed Monthly Charges (FMC) with one minute pulse rate for Gujarat Telecom customers under Postpaid plans mobile services. New Plan 299 offer benefits of Free 600 voice call minutes for both Local/STD with 250MB Free Data Usage and Free 200 SMS without Free calls/usage talk value. Customers will charge outgoing calls @30ps per minute for Local (On-net), Local (Off-net) for Landline/Mobiles @50ps per minute and Local (On-net) to Landline @50ps per minute. For Local/National SMS (SMS Offers) customer will charge @50ps per SMS whereas for International Rs.5 per SMS. BSNL already offering Free National Roaming across the country to receive incoming calls any where in India. Customers while in National Roaming for outgoing calls Local @Rs.1 per minute and Rs.1.5 per minute will be charged with Free incoming call facility. 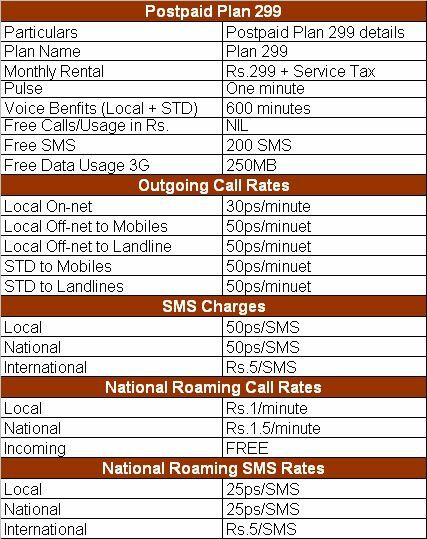 SMS rates for National Roaming will be charged for Local/National @25ps per SMS and Rs.5 per SMS to International SMSes. The above new Postpaid plan 299 will be implemented with effect from 02-11-2015 as Promotional offer basis for a period of 90 days available upto 30-01-2015 across Gujarat Telecom Circle. All other tariffs and terms, Conditions will remain the same as of Postpaid plan of Rs.325/- plan.